This is a practical, effective and proven way to fast track the professional growth of people, project and change managers. It’s appropriate for people who are both new-to-role or experienced. People seek me out for my experience in helping people to make real progress as they balance day-to-day work with an inspiring approach to professional development. Grow as a manager: Develop confidence and skills as you move to a new role, take on fresh challenges, and build your career. I also work under a similar model with teams to promote team development. A flexible, structured and inspiring program based on 1:1 mentoring and coaching. It’s a program designed around your needs and workplace priorities. We start with where you are at today and where you’d like to go next. What are your aspirations, challenges and opportunities? What motivates you? 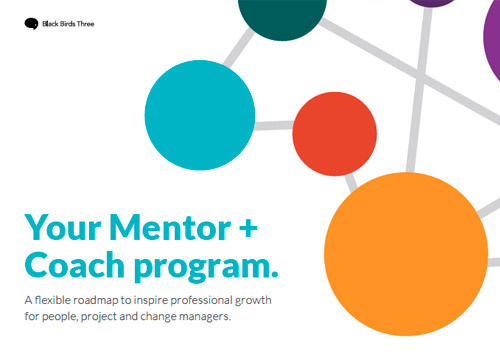 Review the Mentor + Coach program brochure to learn more. This program is for current, new or aspiring managers and leaders who are self-motivated to grow. It’s practical, challenging and fast-tracks your development. It’s ideal if you’re about to take on fresh challenges in your current position or have moved into a new job. You’ll notice a positive difference and other people will, too. You’ll create space for sustainable growth and new ways of thinking. We know that the most powerful, impactful and sustainable learning happens on-the-job. So that’s what we focus on. Where are you at today: mindset, strengths, motivators? What support do you need most right now? What are your learning, development and career goals? What’s the input from your manager? Coaching is about helping you to come up with your own breakthroughs, ideas and solutions. Mentoring helps you learn from the professional experience of another person. This program has a track-record of giving managers the right time, space and mindset to experiment, learn and evolve.